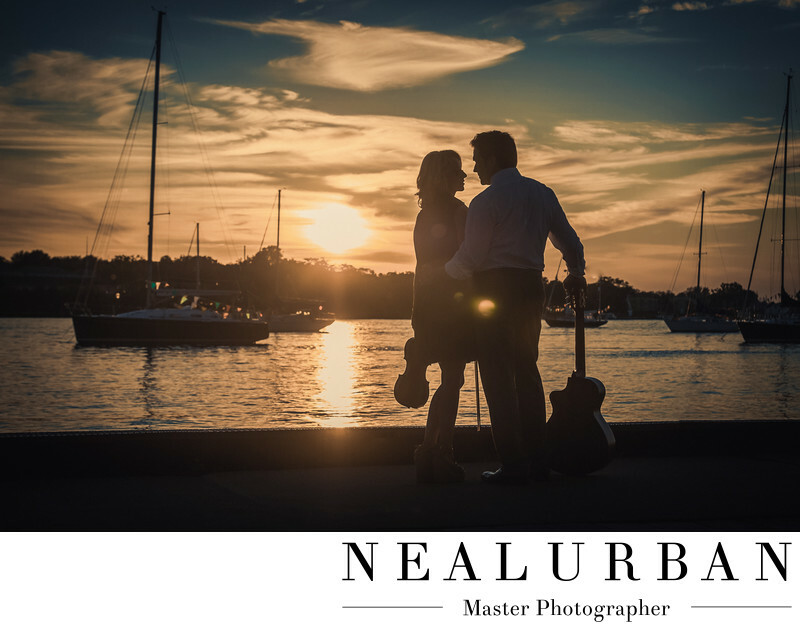 Engagement portraits down by the water can be so amazing. They look so good when we get a nice sunset. For this engagement session we went down by the Youngstown Yacht Club in Youngstown, NY. We loved this because we knew there would be boats docked! The bride to be was a very well known violinist out in Las Vegas. She was part of a girl group called the Violin Femmes. She asked us if she could incorporate her violin for some images. We loved the idea! We had her actually play it for us while standing by the water. She was amazing! There were people sitting around by the water that applauded for her when she finished! Then we found out her fiance played the guitar. Wow! Neal had a great idea for this! He wanted to do silhouette images with them and the instruments. This turned out so beautiful! We had the couple facing each other, but with the violin and guitar to the side so we could see them. We positioned them so the sun was just to the side of them lighting up the water. The back drop was amazing with the sunset, clouds, and boats. We had the best weather for this engagement session. We started the shoot at Fort Niagara State Park just down the road! Location: 491 Water St, Youngstown, NY 14174.